Chemists in The College of Arts and Sciences have figured out how to synthesize nanomaterials with stainless steel-like interfaces. 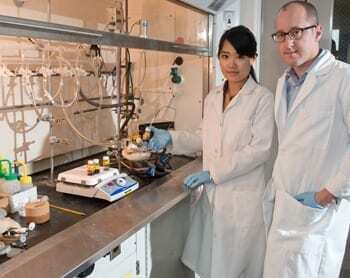 Their discovery may change how the form and structure of nanomaterials are manipulated, particularly those used for gas storage, heterogeneous catalysis and lithium-ion batteries. The findings are the subject of a July 24 article in the journal Small (Wiley-VCH, 2013), co-authored by associate professor Mathew M. Maye and research assistant Wenjie Wu G’11, G’13. Until now, scientists have used many wet-chemical approaches—collectively known as colloidal synthesis—to manipulate reactions in which metallic ions form alloys at the nanoscale. Here, metal nanoparticles are typically 2 to 50 nanometers in size and have highly unique properties, including various colors, high reactivity and novel chemistry. Maye and Wu are part of a growing team of international chemists and materials scientists devising new ways to alter the size, shape and composition of nanoparticles. “At SU, we have developed a new synthetic pathway to tailor the internal microstructure of nanomaterials,” says Maye, whose research spans inorganic chemistry, catalysis, materials science, self-assembly and biotechnology.